About 10 miles from the M1, in North East Derbyshire, lies the small market town of Dronfield. A few weeks ago a friend who had recently visited the Peak District mentioned the place in passing. The name was familiar, although I couldn’t immediately work out why. I suspected there must be a sporting connection, but googling the town told me no more than it was currently home to the world’s oldest football club, Sheffield FC, and a list of its eminent citizens was made up largely of a number of former professional footballers along with a couple of musicians and a golfer, none of whom could have been the reason I had heard of Dronfield. As the question nagged away at me I eventually devoted a few minutes to the 1960s Wisdens that I pored over for hours on end as a child and, as I thought I might, I found my answer there. Dronfield was the birthplace of Alan Ward, a fast bowler who played for Derbyshire and Leicestershire and, five times, for England. Given that of the footballers that Wikipedia lists as coming from the town as many as five never pulled on an international shirt, Ward’s omission from the article strikes me as a significant one, and really ought to be remedied. Today Ward’s name is long forgotten, but he does not deserve to languish in obscurity. He might have been one of the very best had he enjoyed a full career, but sadly he didn’t, being another example of a fast bowler whose body let him down too often. It is counter-intuitive in some ways that, given the ferocity and menace they exude, and the havoc they can cause, the really quick men are as fragile as they are. Shaun Tait and Shane Bond are recent examples, but there are others. The rich promise and raw pace of Alan Ward was spotted by Derbyshire at an early age, and he was just 13 when, in 1961, he first appeared for Derbyshire Juniors against a Derbyshire Club and Ground XI that contained a number of first team players. It was to be another five years before, in 1966 in a County Championship match against Essex at Ilkeston, Ward made his First Class debut. He came on as first change and bowled six overs, taking the wicket of opening batsman Gordon Barker at a cost of just 13 runs. In the manner of the times the match was slow going, Essex not seeming to have attempted to chase a target of 225, ending up on 160-4 after 67 overs. It might have been different had Ward been around to give then the “hurry up” but, as was going to be an all too frequent occurrence in his career, he was not fit to bowl in the second innings. The only other first team appearance in 1966 for Ward came a couple of months later when he was selected to play against Oxford University. This time Ward did take the new ball, but only in the University’s first innings. 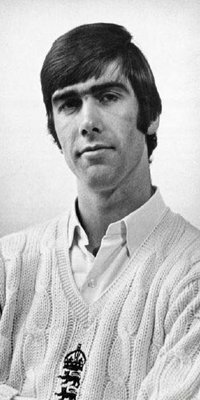 Peter Gibbs, now better known as a writer, was a teammate of Ward’s at Derbyshire for six seasons, but on this occasion he was playing for Oxford in a game he still recalls; My first encounter with Alan was in 1966 when I played for Oxford against Derbyshire. The Year Book describes it as a ‘dull and cloudy’ day. It was in fact one of Stygian gloom, the light barely fit to play and a Derby ‘green top’ to boot. I was out early but not before this tall streak of a youth had run in and whistled the ball at high speed past my eyebrows. His figures weren’t that remarkable, no wicket for 46 in 13 overs, and the fact that he was missing injured for the second innings was a sad portent of what was to come. In 1967 Ward came in to the first team for four matches in August whilst Brian Jackson was injured. He only bowled 58 overs altogether, but 8 wickets at 23.50 showed he was ready. He must have bowled very straight in those days as well. Five of his eight victims were bowled, and two more lbw. It was August the following year that Ward next played for the first team, and it was a local derby against Leicestershire. Ward’s impressive fast bowling gave Derbyshire an early breakthroughproclaimed Wisden, and he ended up with 3-74, but the game petered out into a draw, Ward yet again unable to bowl in the second innings. After three weeks rest Ward’s next outing was against Yorkshire. His side held on for a draw in the end, and would certainly have lost had Ward not been able to deliver 29.2 controlled and penetrative overs over the two Yorkshire innings, in which he took 5-54. His victims were Test batsmen Philip Sharpe, Doug Padgett and John Hampshire, as well as youngster John Woodford and, perhaps most satisfying of all to the 21 year old tyro pacer, Fred Trueman. Derbyshire’s next match was the game that propelled Ward onto the back pages of the national papers as Derbyshire humbled Glamorgan on their own Sophia Gardens pitch by 100 runs. This was a powerful Glamorgan side that finished third in the Championship that summer, and won it the following year, but they had no answer to the pace attack of Ward and Harold Rhodes. Ward’s match haul was 10-94, and it was he rather than Rhodes who opened up the Welsh county by removing both openers in each innings. With eight more victims in his fourth and final Championship match of the season, and another four in a festival match at Scarborough Ward ended up with 30 wickets at 13.30. He was second in the national averages. Prior to the 1969 edition the Derbyshire correspondent of Wisden, local journalist Michael Carey, had not mentioned Ward, but he waxed lyrical this time, writing …..he produced venomous pace and bounce from a controlled run up and lithe, whippy action; he was regarded by players and critics alike as the fastest bowler in the country and comparisons were made with the early Tyson. But there was a note of caution too, as he added Ward did not develop overnight. Derbyshire had been nursing him for several years until his strength caught up with his considerable stature. The two now appear to be in harness, but Ward still has to take on the mental and physical stresses and strains of a full Championship season. In the past he has been prone to break down. One imagines that not only Derbyshire but the entire country will be hoping that this is the year that Ward’s exciting potential blossoms to full maturity. To the delight of all Derbyshire Ward went one better in 1969 and finished at the head of the First Class averages with 69 wickets at an average of 14.82. The county’s supporters only disappointment would have been that in the early part of the season Rhodes struggled with injury, and by the time he was fully fit Ward was playing in all of the three Tests against New Zealand, so they rarely saw what promised to be as quick an opening pair as the county game had seen firing on all cylinders. And sadly they never did again as Rhodes, only 33 but disenchanted with the game after spending eight years under the cloud of constant controversy over his action, retired at the end of the summer to the less stressful setting of league cricket, barely a year after finally being vindicated. In 1969, then as now, the England selectors tended to be a conservative bunch, and their actions that summer are the best illustration there is of the excitement that Ward was creating throughout the country. By the time of the second Test against West Indies, towards the end of June, Ward had had three years of First Class cricket and played just 22 games, but he had made that tremendous impact at the end of the previous season, and at that stage in 1969 sat comfortably on top of the First Class averages with 37 wickets at 13.75. He was called into the squad for the Test at Lord’s so that he could sample the atmosphere, and was there again for the third Test as cover for David Brown. The Warwickshire man was fit to play in the end, but for the next squad, for the first Test against New Zealand , Ward’s name was still there but that of John Snow was not, thus confirming that Derbyshire’s exciting young prospect would play. The New Zealanders were by no means the strongest opposition England could have faced, and indeed it would be 17 more years before they finally beat England in a Test in England. They were however a durable side, and Ward had every reason to be pleased with his return of 10 wickets at 21.00. It was a series dominated by Derek Underwood and the wickets on which he and England skipper Ray Illingworth thrived were not much help to Ward, who was the pick of England’s quicker bowlers. Of the other four pacemen who appeared the next highest wicket taker was Snow, whose three wickets cost him 154 runs. There was no England tour scheduled for the winter of 1969/70, so Ward just had to maintain his fitness and the new season dawned with him in fine form. He scythed through the Sussex batting at Buxton to take 6-30 and 4-83 in a comfortable Derbyshire win, and just over a week later was an automatic choice for the first “Test” against Garry Sobers’s powerful Rest of the World side, a combination hurriedly put together when the South African visit was finally cancelled at the eleventh hour. Ward could not prevent a heavy England defeat but Wisden confirmed that he was the best of the English bowlers. He took four wickets, bowling Clive Lloyd, Farokh Engineer and Intikhab Alam, and having Barry Richards caught at slip in the Rest’s only innings. Unfortunately after that performance against the Rest Ward’s season spluttered like an old Austin Maxi for the next few weeks as he struggled with an ankle injury. He missed the rest of the series, although he did at least have the consolation of regaining his fitness in time to take his place with the England side that left for Australia that winter. For England , and enforcer Snow in particular, it was success all the way as Illingworth became the first England captain since Douglas Jardine to regain the Ashes on Australian soil. With Ward at his best the 2-0 winning margin might have been greater still, but he had a miserable tour. After bowling at half pace in a couple of state games an x-ray revealed a leg fracture and he was on his way back to Derbyshire, to be replaced by the next young quick on the block, a 21 year old Bob Willis. It was a huge setback – after the party arrived in Australia Illingworth had said There isn’t an opening attack in the world to compare with John Snow and Alan Ward and fast bowling usually turns the scales in Australia … I am banking on speed. By the start of the new season Ward had recovered his fitness, but injury troubles were never too far away. Superficially his figures weren’t too bad, 61 wickets at 28.36, but the cost was higher than hitherto. He made the England side for the first Test against Pakistan, but in taking 0-115 he was disappointing. He missed the second Test through injury, and did not regain his place. In Wisden for 1972 Carey was looking for positives, but was realistic; Ward had days when he looked an England bowler once more, but these were counterbalanced by absence through injury and the fact that he did not once take five wickets in an innings. After spending a successful winter in South Africa, Ward returned for the 1972 Ashes summer looking to win back his Test berth. Carey described him as once again an enigma, he bowled with sustained hostility at the start of the season. Towards the end of May he was selected for what amounted to a Test trial, for MCC against the tourists. Ward began menacingly and soon removed Stackpole and Ian Chappell reported Wisden, but by the end of the month a pulled muscle left him out of action until September. Presciently Carey added his absence seemed an extraordinarily long one for such an injury and, in the end, there seemed to be mental as well as physical barriers to be crossed. The summer of 1973 was not a happy one for Ward. He played in all of Derbyshire’s first six matches but took just 7 wickets and paid 48.28 runs each for them. The next game was against Yorkshire, and Ward hit the headlines when he was sent off the field by his own captain, Brian Bolus. Derbyshire batted first and were dismissed early on the second morning for 311. Ward was never a reliable batsman, as a career average of 8.43 demonstrates, but his mood was doubtless not helped by being dismissed for a duck. With the ball he removed Geoff Boycott early in Yorkshire’s response, and later produced a delivery that should have resulted in John Hampshire being out before scoring, but the chance was put down. Despite that he was bowling poorly and there were nine no balls and, after lunch, Hampshire rubbed salt in the wound by taking 19 from one of his overs. Bolus, no doubt senseing the way the wind was blowing, took Ward out of the firing line and did not call on him again that session. When, after tea, he called upon his fastest bowler again Ward refused to bowl. Clearly anticipating trouble Bolus had been off the field a few minutes earlier speaking to the Derbyshire secretary, and he had no hesitation in waving Ward off the field. In Wisden Carey was critical; His action showed scant regard for his teammates and for the needs of a county which had handled him sympathetically throughout his career., although in fairness to Ward he had apologised before the close of play. That apology notwithstanding he still announced his retirement three days later. He was quoted in John Shawcroft’s 1989 History of Derbyshire County Cricket Club as saying When Brian asked me to bowl, something exploded inside me. I couldn’t go on. People will never understand, but all I wanted to do was to get off the pitch. The incident is clearly a regrettable one, although it proved to be cathartic, as five months later Ward signed a new one year contract, and looked a different bowler in 1974. He took 56 wickets at 20.96 for the season including a career best 7-42 against Glamorgan as the Welsh county were dismissed for just 99. Even two dropped catches didn’t disturb the concentration of a man who showed his fitness and stamina by bowling unchanged through the innings with 22 overs. He also had a match haul of 10-104 against Leicestershire, the first time he had achieved that since 1970. As late as the end of August, by which time Derbyshire were clearly destined for the wooden spoon, he was still bowling with sufficient enthusiasm for one opponent to describe his performance against him as the best fast bowling we have seen from an Englishman all summer. In Wisden Carey noted that Ward was more buoyant, more relaxed , able to bowl within himself but still capable of spells of genuine pace and, as a result, bowled teams out with a consistency never previously shown in his career. England went to Australia in 1974/75, and met an old friend in Dennis Lillee – who they thought injury had finished – and a new one in Jeff Thomson – who they had never heard of. The series resulted in a drubbing of embarassing proportions and England must have rued not taking Ward or Snow, who had had an excellent season as well. It is doubtful whether the pair would have made a difference to the result, but at least Mike Denness would have been able to give the Australian batsmen something by way of retaliation. Previous experience suggested that the good times would not last, and they didn’t. In 1975 Ward played in only 10 games, taking 22 wickets at 32.18. As was so often the case there was some bad luck as he picked up an injury in pre-season and then came back too soon. Carey commented that on occasions he found his old pace and fire, looking as fast as any current England bowler, but his wickets were rather more expensive than one expects from a bowler of his quality and the question mark over his ability to live with the aches and pains of a fast bowler’s life remains. 1976 will forever be remembered by those who lived through it as the year of the long hot summer and, by cricket fans, for the unfulfilled promise of England skipper Tony Greig to make Clive Lloyd’s West Indians grovel. For Ward it was, to say the least, an up and down summer. Overall he performed reasonably well, taking 47 wickets at 24.76, and he remained injury free until August. The high point came at the end of July when, amidst a minor injury crisis, he regained his England place for the fourth Test. In truth it was a belated attempt to fight fire with fire as he joined Snow and Willis, and England fielded her three quickest bowlers. He was expensive in the first innings, going for 103 in 15 overs, but he also took the wickets of Lloyd and Collis King in successive deliveries. In the tourists second innings his bowling was much tighter, his 9 overs costing 25 runs, and he got Lloyd again, as well as Gordon Greenidge. England’s target in the fourth innings was 260, but they ended up 55 runs short. A glance at the scorecard shows Ward making a pair, but that does not tell the story of his batting. In the second innings he stayed with Greig for 47 minutes whilst the ninth wicket added 46. Had just one of David Steele, Frank Hayes, Chris Balderstone or Alan Knott shown such durability then England might well have gone to the Oval with all to play for. As it was they were 2-0 down, and their pace attack broken up after just one outing, Snow and Ward both missing the game through injury. Given his reappearance in England colours it seems odd that 1976 ended up as Ward’s final season with Derbyshire, who made the decision to release him at the end of the summer. Taking into account that one of the men on the committee that made that decison, Charlie Elliott, was also one of the Test selectors who had brought Ward back into the England fold, it appears at first glance to be almost bizarre. In his balanced way Carey’s observation was the inevitable controversy reared its head at the end of the season when Ward was not re-engaged, a decision which raised a few eyebrows, coming as it did only a few weeks after he had played for England. Contrary to reputation Ward remained injury free until August and often bowled well, but clearly the new captain felt that his day in, day out contribution did not reflect his ability.And therein lay the answer. The popular wicketkeeper Bob Taylor, probably not sufficiently ruthless to ever make a great captain, had handed over the reins in mid-season to Derbyshire’s new overseas acquisition, the combative South African all-rounder Eddie Barlow. Ward was not out of work though, because as soon as his release was made public the offer of a three year contract came in from neighbours Leicestershire, who after years in the doldrums had become a power in the land under the captaincy of Ray Illingworth, long an admirer of Ward. But the move did not work out. Ward stayed fit for 1977, but had a disappointing return of 33 wickets at 28.96. The following year he played just twice. In the second match, against Warwickshire at Grace Road, he limped out of the attack after four overs and that was it. Later in the summer eight second eleven games brought just 8 wickets and the remainder of his contract was cancelled by mutual consent. There was barely a ripple in the media, and the man who might have been the greatest English fast bowler of his generation left the game as quietly as he had come into it. Ward’s first post cricket occupation was, in common with so many former professional sportsmen, as a publican but that didn’t suit him. He then moved to Australia where he coached in Toowoomba in Queensland, and he also played as a batsmen and off spinner. He might have stayed but family reasons brought him home to Derbyshire where he then set up and ran a home improvement business as well as doing some coaching. His eldest son David, born an Aussie, was a promising all-rounder who came to Derbyshire’s notice, but he didn’t quite make the grade. Ward is now 66 years of age and has, some believe, returned to Australia – but he has certainly defied my attempts to track him down. For a judgment on Alan Ward I return to the eloquent Peter Gibbs who told me The retirement of Brian Jackson meant that Alan had a ready opening in ’68 to step into his shoes as partner to Harold Rhodes. Skipper Derek Morgan wrote of his “tremendous impact on the game in the last few matches of the season when he turned in sensational performances” and wondered if he would “follow in the best Derbyshire fast bowling tradition”. But part of that tradition had been our bowlers’ great durability. Alan’s susceptibility to muscle strains robbed the county’s attack of a really exciting spearhead and the man himself of a regular England place. I was pleased to see Alan Ward’s brief career covered – he played in the first Test match I ever watched on TV (Headingley ’76) so I thought he must be an England regular. Couldn’t have been more wrong there! I’ve seen a little of him bowling to Zaheer in 1971 and he had what you might call a ‘whole-hearted’ action, putting a lot of strain on himself. He does have an entry in Wiki, and surprisingly so does his son! A cracking piece Martin, I really enjoyed it. It’s nice to see someone do justice to a part of my home county’s quick bowling heritage. An excellent piece on an enigmatic player. I was in the Pavilion at Queens Park (skiving school) when Alan Ward was sent off. No announcements were made as to what had happened, most around me assumed that Bolus had allowed Ward to leave the field because of an injury. The truth filtered out via the pressbox. I remember Ward walking up the pavilion steps at some point in the match and commenting ruefully on “bloody Chesterfield wickets.” Looking back, for all Derbyshire’s attempts at nurture, Ward was clearly fragile. Mike Carey’s comments are understandable, but had Mike Brearley or someone like him been in charge on the field Ward might have found empathy and more appropriate support. Trueman’s remark says more about the man and his times than about Ward and his problems. Gibbs, Morgan and Carey provide a wiser, more generous assessment.